In September 2014 I visited Ribera del Duero and blind-tasted around 120 wines for the purpose of selecting a ‘Top 50’. It was a fascinating exercise, and the list of the Top 50 wines plus their UK availability and stockists is currently being compiled. Meanwhile, I also spent a couple of days getting to know the region and visit three estates. Here is an overview of this interesting region and the producers I visited. There’s a fascination with vineyards at altitude. Famously in Argentina of course, where vines creep up the slopes of the Andes and are planted at an average of somewhere around 1,000 metres or almost 3,500 feet. That’s more or less the same as the summit of Mount Snowden. But whilst lofty Mendoza might grab the column inches, there are several wine regions much closer to home that operate at similar elevated levels. Lebanon’s Bekaa Valley, for example, also has an average altitude of 1,000 metres, as does the Etna region on Sicily. But also playing in the big league is Ribera del Duero in northwest Spain. Here, vineyards only begin around 600 metres and the best are between 800 and 1,1000 metres. Why is that important? Well, as a general rule of thumb average temperature during the growing season will drop by around 0.8°C for every 100 metres elevation. So at 1,000 metres temperatures will be 8°C cooler on average. It also means a large diurnal shift (the difference between day and night temperatures). And that is very good news for quality wine grapes. Two hours driving northwest of Madrid, Ribera del Duero sits on the great northern plateau of the Iberian Peninsula. It extends over four provinces of Castilla y León: Valladolid, Burgos, Segovia and Soria. It’s most famous sub-region is towards Valladolid in the west, site of the so-called ‘Golden Mile’, where wineries including Vega Sicilia and Pingus are based. Between them, Valladolid and Burgos provinces are home to the vast majority of the best known names. With very few exceptions, Ribera del Duero had been a bulk wine producer until as recently as 1982 when it was granted D.O. (Denominación de Origen) status. At that time there were just seven operating wineries, and 6,560 hectares of vineyard. Fast forward a mere 31 years to 2013, and there were 279 operating wineries and 21,731 hectares of vineyard. The growth has been phenomenal, with massive investment in the region from elsewhere in Spain and overseas. That has been thanks largely to the prominence given to the region by its superstar estates, which picked up very high scores from US and other critics. Names like Vega Sicilia, Pesquera and Pingus led the way. Ribera del Duero is a red wine D.O., with a tiny proportion of rosé. 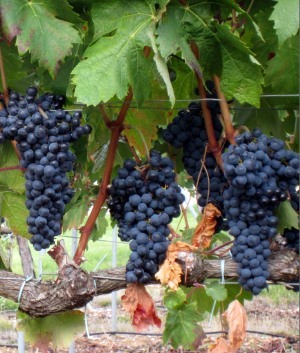 The main grape with over 95% of plantings is Tempranillo, sometime known locally as Tinta del País. There is a small amount of Grenache and the white grape Albillo, and around 4% is Bordeaux varieties. 25.5% of vines are more than 50 years old, and those are mostly ‘Gobolet’ pruned as free-standing and unirrigated bush vines. Vineyards lie on both banks of the Duero River at an average Altitude of 837 metres (2750 feet). rainfall is low to moderate and it is a Continental climate with dry summers when the temperature can climb to 40°C (hence the need for that elevation) and long, cold winters when temperatures can plunge to -18°C. If one criticism could be levelled at the region it is that many of the wines tended to play towards a globalised (some might say ‘Parkerised’) market: heavily oaked, ultra-ripe and quite extracted wines that tried too hard to be ‘show wines’ rather than drinking wines. That style is now somewhat out of favour and it seemed on my visit that the wine growers of Ribera are alive to the problem. There has been a concerted effort by many to subtly change the style of their wines without losing their identity. Vineyards move ever higher into the mountains, ripeness and extraction are being managed, and a ‘new’, more supple and fresh Ribera del Duero is evident in tasting. Around 56 million bottles of Joven and Roble Ribera del Duero are produced annually, 18 million bottles of Crianza and just four million of Reserva. Production of Gran Reserva is much less than one million bottles. Around 25% of the total is exported. The rush to develop Ribera del Duero has seen expansion at break-neck speed and no doubt some producers will be more focused on ultimate quality and expression of these terroirs than others. 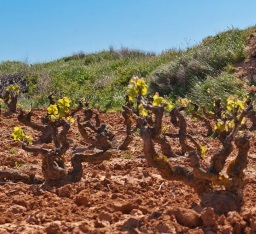 But there are superb vineyards here, some great winemakers, and perhaps Ribera del Duero is now entering a period of consolidation and self examination that will see quality improve even more and the identity of the region being further refined. The three estates I visited represent Ribera del Duero quite neatly: one small family winery, one much larger but still family-owned concern, and a big, fairly slick operation established by investors into this region from outside. Comenge’s vineyards and winery sit in a stunning and evocative location, immediately below the Tolkeinesqe castle of Curiel de Duero, just a few kilometres from Peñafiel in the west of the region. This is a family business, started by ex-diplomat Jaime Comenge, inspired by his father, Miguel, professor of pharmacology and author of the text book ‘La Vid y los Vinos Españoles’, published in 1942 and one of the first text books on Spanish wine. Today Jaime is still very much in evidence, as is his son Alfonso who runs the commercial side of the business, and I was joined on my visit by their long-time winemaker Raphael Cuerda (right), who has been with Comenge since it began in 2000. 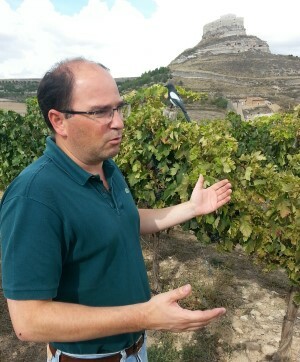 He met Jaime Comenge when Jaime signed up for a winemaking course in Madrid before setting up the winery. Walking through the vineyard Raphael points out the high trellising which keeps airflow through the grapes, and notes that his grapes and bunches are relatively small because of the altitude and climate here, where spring and autumn frosts are a constant threat. In the winery there is a bunch selection table before de-stemming, then a second table staffed by a dozen hand sorters, selecting grape by grape. For fermentation they use an indigenous yeast, isolated for them from their vineyards by the University of Madrid. The wines undergo a long pre-ferment maceration, partly to allow the yeast population to build. Maturation is mostly in French oak, with 15% American oak – though only French barrels are used for their top wine, Don Miguel Reserva, which is not made every year. There will be no 2013 for example and they are “still deciding,” on 2012.
for tasting notes on six wines from Bodegas Comenge. Arzuaga is a substantial family winery with five-star hotel and vinotherapy spa attached, and an excellent and busy restaurant. It is situated on the ‘golden mile’, its neighbour Vega Sicilia visible from the dining room windows. 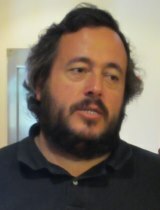 I met and said a brief hello to founder Florentino Arzuaga, before his son Ignacio, general manager, showed me around. “From the beginning we have made more classical wines,” he began, “We are not part of the ‘new Spanish’ modern style.” The family also farms olives and has wineries in other regions, and Ignacio tells me they are also involved in the haute couture and hospitality industries. The vineyards and winery were established in 1983 – just a year after the D.O. 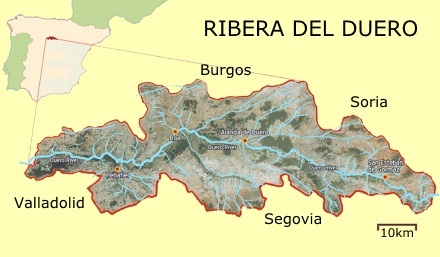 Ribera del Duero was declared. They have 150 hectares of their of own vines, plus some more that they manage, spread around 40 different plots on both sides of the Duero River. 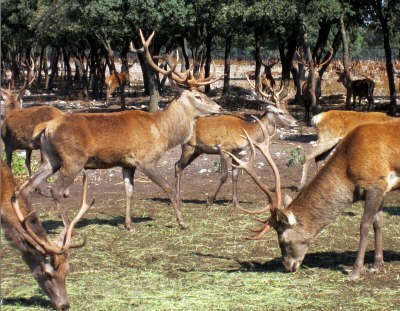 We jumped into a jeep and took a trip to their nearby La Planta vineyard, part of a 15,000 hectare estate around the old family home and one with huge diversity – 1,000 different animal species have been identified on the estate, including this herd of deer on the edge of the vineyard. At 950 metres La Planta “Allows a slow process of maturation and retention of acidity – it is the secret of our wines,” according to Ignacio (left). “We have very few diseases, so farm almost organically, and we ferment only with wild yeasts from the vineyards. We have some organic vineyards and have produced our first certified organic wine.” The soils here are rocky clay, with limestone one metre below. Grass is sown between rows to compete with vines and reduce vigour. Intriguingly, as well as Tempranillo, Cabernet Sauvignon and Merlot, they also grow some Chardonnay and Pinot Noir, bottled as a ‘Vino de Mesa.’ It is an innovative and extremely high quality estate, and one of relatively few that utilises the maximum of 5% of the white Albillo allowed in red wines, in their top cuvées, to add natural acidity. Owned by the sizeable Codorniu group, there is a very ‘New World’ feel to the Legaris operation – not just in the sparkling and spacious high tech winery, open to receive visitors, but in the large expanses of contiguous vineyard, trained high, neatly hedged, and set up for mechanical harvesting. Right: ripe Tempranillo. Legaris was established 1998 when there were around 150 wineries already operating in the region – so about half way through the rocket-like growth of the Ribera D.O. from its single figure beginnings in 1982. This was part of an aggressive expansion by Cava house Codorniu in the 1990s, which saw them purchase or build a number of new estates in Spain and South America. There are 54 hectares of vineyard around the winery in Peñafiel, plus 39 more in Burgos to the east of the region. They produce 750,000 bottles, from the big production Roble, aged three months in oak, to just 50,000 bottles maximum of the Reserva. The entire Codorniu group grades the quality of its grapes from A (top) to G (bottom). In Ribera they use only grades A to C, and all other fruit is sold off. ‘A’ class grapes are very ripe and destined for the Reserva. Around 70% of sales are domestic, and Switzerland is the biggest export market taking 50% of all Reserva for example. Bodegas Legaris is also working on a new ‘icon wine’, fermented and matured in new oak. Though not yet released, 2009 is the first vintage to be made. In the vineyard a system of overhead sprinklers is there to guard against frost, and there’s lots of high tech analysis: of water take up, vine vigour and other parameters. There is a huge barrel programme in the winery with 20 different barrels suppliers, not just French and American but Hungarian and Slavonian oak being trialled. American oak only is used at Roble level, French only for the Reserva.